The Cliff™ range of cabinet rack and strap handles are intended for use on wood, MDF, chipboard or metal enclosures. Manufactured from a range of materials, including ABS, GRP and PP, our handles are designed to enhance the appearance and functionality of any equipment to which they are fitted. All models are suitable for the most demanding applications. Some parts can be custom branded. 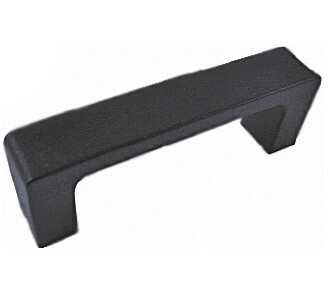 CH-3A One piece, moulded, molded, 2U cabinet rack handle. Matt black finish. For fixing, use number 6 self tapping screws 5/8″ long. Weight 9.2 Kg. per 1000. 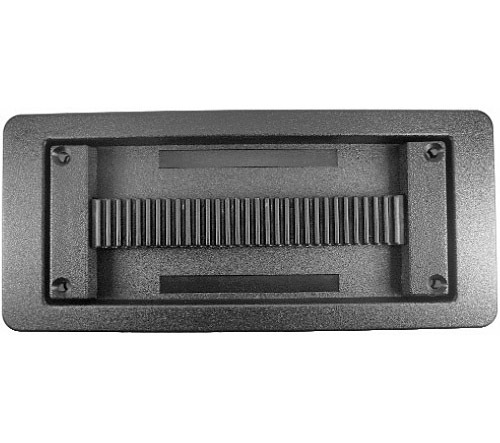 CP3016 CH-3A rack handle. Not for new designs. CH-4 Strap handle and fixing ends. Textured matt black finish. Breaking strength > 200 Kg. Fixing by suitable wood screws or nuts and bolts. Supplied as one handle and two end pieces. Foam can be fitted in the ends to prevent any rattle. OD6560 CH-4 strap handle and ends. CH-4 Recess Plate For flush mounting the CH-4 strap handle. Textured matt black finish. Knockouts for jack sockets are provided. Can also be used as a general purpose recess plate. Combined weight 55 Kg. per 1000, (handle and recess plate). 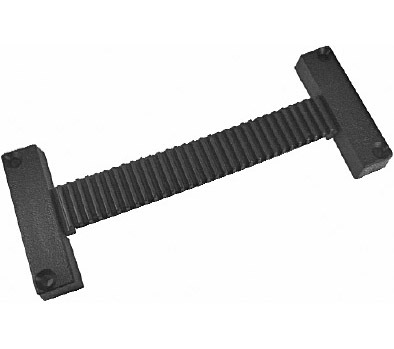 CL1913 CH-4 strap handle recess plate. 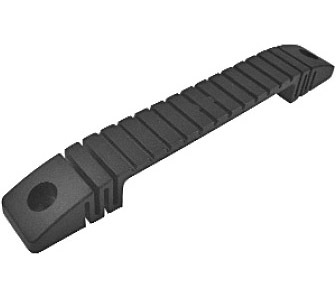 CH-5 6″ long strap handle. Black vinyl handle with steel insert. Nominal lifting strength ~ 30lbs. 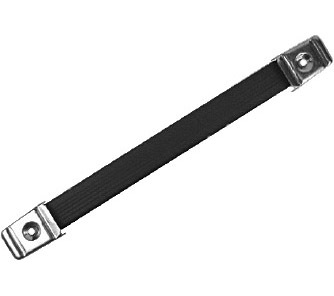 OD65632 CH-5 strap handle only. OD65638 Pair of D ends with snap-on screw covers. Weight 3.8 Kg. per 100, (strap and ends). OD65636 Pair of E ends with visible screws. Weight 3.1 Kg. per 100, (strap and ends). CH-6 8″ long strap handle. Black vinyl handle and steel insert. Nominal lifting strength ~ 30lbs. OD65634 CH-6 strap handle only. OD65638 Pair of D ends with snap-on screw covers. Weight 4.2 Kg. per 100, (strap and ends). OD65636 Pair of E ends with visible screws. Weight 3.5 Kg. per 100, (strap and ends). 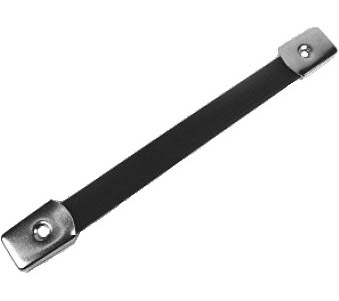 CH-7DC 10″ long strap handle with tough extruded vinyl handle and steel insert. Nominal lifting strength ~ 50lbs. FM6878 CH-7DC strap handle only. FC68787 Pair of DC ends with visible screws. Weight 10.5 Kg. per 100, (strap and ends). CH-8 7″ long, elegant, one-piece moulded molded handle. Matt black finish. Useable for static loads up to 15 Kg. Nominal lifting strength ~ 35lbs. CL19135 CH-8 strap handle. Weight 3.5 Kg. per100. 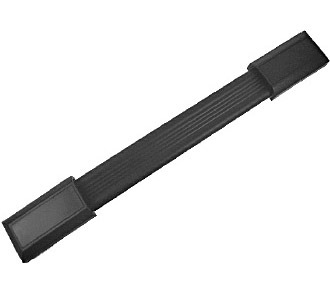 CH-10 10″ long, tough, extruded, vinyl, strap handle with steel insert. Matt black, plastic screw cover ends. Nominal lifting strength ~ 50lbs. FM6878 CH-10 strap handle only. FCR68787 Pair of CH-10 ends. Weight 6.5 Kg. per 100.